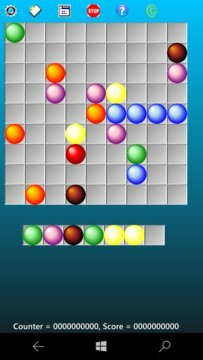 The Align Game objective is to arrange same color balls in a straight Align of five (or more), while three to seven new balls come on every turn. To start playing, you have to move a ball (select one ball (click on ball) and move it to the most convenient location (click on target square)). The balls can be aligned in any of the four directions (vertical, horizontal and diagonals). Align of 5 or more balls of the same color are eliminated, adding to the score. 1 - normal without assistance. 2 - normal with Joker balls (valid for any color lines). 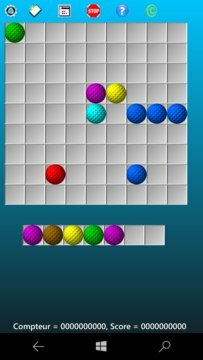 3 - eazy : the game places balls conveniently on existing lines. 4 - helping with grouping same color balls. Use the Inser key to activate or stop mouse emulation. This version includes seventeen translations (German (Germany),English (United States),Arabic (Saudi Arabia),Bangla (Bangladesh),Chinese (China),Spanish (Spain),French France),Hindi (India),Hungarian (Hungary),Italian (Italy),Japanese (Japan),Malay,Dutch (Netherlands),Norwegian (bokmål) (Norway),Portuguese (Portugal),Russian (Russia),Swedish (Sweden)).